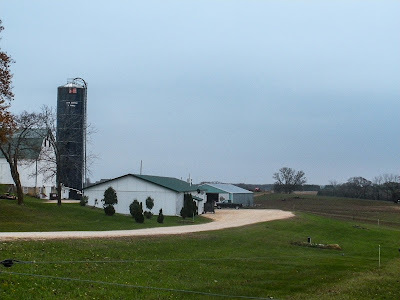 When I decided that I was going to Wisconsin to stage at Underground Meat's curing shop, I realized there was one other place I needed to visit. Uplands Cheese, in the rolling hills of Dodgeville, Wisconsin, makes two of my favorite cheese on planet Earth. 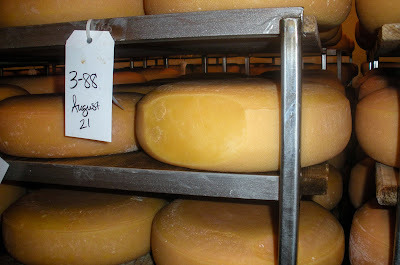 Although Sbrinz will always hold a special place in my heart, the cheese of Uplands always give it a run for the money. 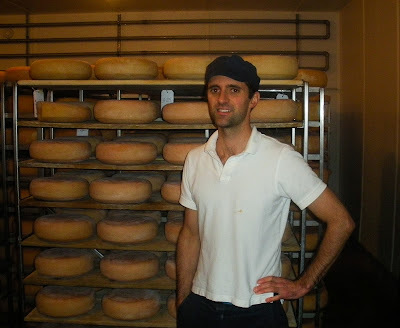 Uplands only makes two cheeses, which is unique; Pleasant Ridge Reserve, a raw milk, grass fed Comte-style cheese, and Rush Creek Reserve, a grass-fed raw milk Vacherin Mont d'Or style of cheese. Regular readers of this blog might remember that Carla pulled out all the stops to get me a wheel of Rush Creek on its first year of production. Along with producing amazing, beautiful, and (most importantly) delicious cheese, Uplands is also the only cheese maker to win "Best in Show" at the American Cheese Society three (3!) times. But they do a lot of work to get there. Everyday they evaluate and test their raw cow's milk, and if it doesn't meet their standards, it's sold on the dairy market. Only the milk that meets their stringent standards is turned into cheese. And Rush Creek is only made in late fall, when the milk is rich and fatty. In a world of consumers who want peaches in December and lamb in February, making an award winning cheese according to the turns of the season seems like a business plan disaster. But it's quite the opposite. Anyone I've ever met who's tried Rush Creek seems to begin to salivate in anticipation. Like first of the season strawberries, Rush Creek is something to savor and look forward too. The clamor when the first shipment is released among cheese lovers and specialty shops is amazing. Talking to Andy Hatch, who heads the cheese making at Uplands with founder Mike Gingrich, Andy really explained what a labor of love Rush Creek is. 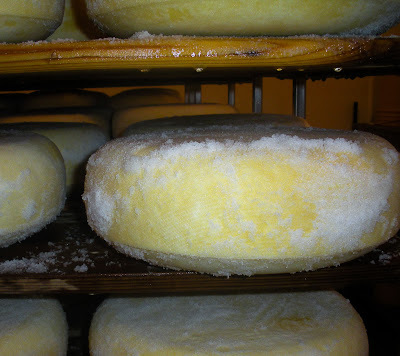 Pleasant Ridge Reserve weighs in at 9-10 lbs. But the little Rush Creeks only weigh 8 oz. 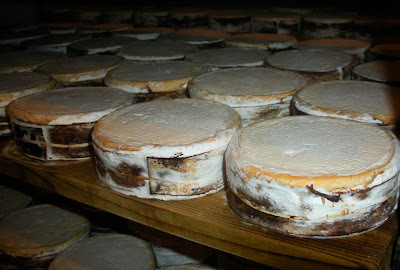 Each one requires brining, brushing, wrapping in strips of spruce bark (just like its inspiration, Vacherin Mont d'Or), and regular turning, washing and brushing. Then, when the cheese is at peak, the baby wheels are hand wrapped and stickered for sale. That's a lot of work going into each baby wheel. Seeing the Uplands operations, I was just in awe. This is the way a dairy is meant to be. Cheese is made according to the seasons. The flavorful milk of spring and summer is turned into a beautiful, long-aging cheese, while the rich, fatty milk of fall is turned into gooey, runny wheels of washed rind goodness. The cows live and graze outdoors, and male cows aren't sold off at auction at birth to industrial veal factories. The bull calves live outdoors and free among the herd, living a natural life until they're sold as "rose" veal to (of course) Underground Meats. Perhaps this is why Uplands is so often listed as one of America's best cheese makers. They don't do anything magical or extraordinary; instead they do everything right, from pasture to palate.